Looking down the vista of the past ages we see standing conspicuous among men David, the father of Solomon. In David's case it is as if the all-wise God had constructed in one human being an organ with all the keys and stops possible to humanity, and as if the Holy Ghost had on that organ with those keys and stops played every tune of every song that all humanity may need to sing in life or death, or carry in memory from earth to heaven. When we remember who Solomon's father was we are helped to grasp the significance of the life and character of the son, who, narrower indeed than his father, was yet more brilliant and more intense. In 1033 B.C., shortly after the death of David's first child by Bathsheba, which was begotten in sin, a second child was born, whom David called "Solomon," or "peaceful," probably with reference to the peace between God and David brought about by the latter's deep penitence for his sin against Uriah. But the Prophet Nathan, to whose wise and tender care he was early committed, called him "Jedediah," or, "The beloved of the Lord." If, as the best authorities are agreed, Solomon wrote the thirty-first chapter of Proverbs, he had still another name, "Lemuel," which means, "to God," or "dedicated to God." The great number and variety of traditions about Solomon extant in Persia, Arabia, Abyssinia, and among the Jews and other peoples, is a proof of the profound impression which he made on his age, and an evidence of his greatness; for only the great among men beget many traditions. Before taking up the authentic and credible history of Solomon a few specimens of these traditions may well receive our attention. The Abyssinians claim that a son given to the Queen of Sheba by Solomon was the founder of their imperial dynasty! In Persian literature Solomon is a favorite character. With nothing to say of David, it has countless stories of his gifted son. One alone, called "Solomon-Nameh," fills eighty books. Arabia also claims Solomon as the Father of her kings, and to this day, under the eastern sky dusky Arabs sit around the lonely tent-fire and tell weird and wonderful tales of the wit, wisdom, and wealth of Solomon. Legends of which he is the hero are also preserved not only in Asia and Africa, but also in the remotest corners of Europe. According to these stories he could interpret the language of birds and beasts, was acquainted with the mysterious virtues of herbs and gems, knew spells for casting out demons and charms for curing diseases, possessed a ring which revealed to him the past, present, and future, was acquainted with the arts of magic and by them made evil spirits his slaves, who helped him with his vast buildings and other great enterprises. It was with the assistance of demons called Jinns that he built the gorgeous city of Persepolis; while other evil spirits, rebelling, he conquered after a long and fierce struggle and immured in dark depths and caves of the sea. But let us return to sober history. The only trustworthy account of the wise king available, is that which is written in the Bible and in the crumbling ruins of his great buildings and public and private works in the East, especially in and around Jerusalem. He was ten years of age when the rebellion of his older brother, Absalom, fell almost like a death-blow upon the brow and heart of his aged father David, with whom he shared the perils of flight and a brief exile. Not many years later Adonijah, another brother, with the connivance of Joab, David's rugged old general, and Abiathar, the elder high priest, attempting to steal the throne, Zadok the high priest, Nathan the prophet, and Benaiah, the most famous and heroic of Israel's captains after Joab, together with Bathsheba, the beautiful and ambitious mother of Solomon, succeeded in thwarting Adonijah's base designs and roused in David for a short time his old-time energy. Whereupon he placed Solomon upon the throne while yet a young man only fifteen or twenty years of age. Upon taking up his sceptre Solomon first of all, removed his father's enemies and the heads of the conspiracies which had been made against the throne, not even hesitating to cut off Joab, whose deeds of prowess had added a marvellous lustre to the military fame of Israel. Solomon now sat secure upon his throne, the undisputed monarch of the wide territory secured by the conquests of his great father. About this time, in order to strengthen his kingdom, he married a daughter of the Pharaoh of Northern Egypt, an alliance which pleased the people, for it showed that their king was a king among kings. The end of this political alliance, however, was not as brilliant as its beginning promised; because, although Egypt was at that time the most mighty nation of the world, because the most wealthy and civilized, yet it was divided into two kingdoms, and after the lapse of years, the Pharaoh of the united kingdom did not hesitate to become Solomon's foe because one of his wives had been an Egyptian princess. After removing the enemies of the throne, and marrying the daughter of Pharaoh, Solomon repaired to the heights of Gibeon, six miles north of Jerusalem, a spot far-famed as the home of the Tabernacle of the Congregation, which was the original Tent of the wanderings. On the brazen altar in front of the Tabernacle the young king offered to Jehovah a holocaust of a thousand victims. It was on the night after this magnificent sacrifice that the Lord offered to Solomon, dreaming, his heart's chief desire. The wise and as yet pious young king asking for wisdom, the Lord was so pleased that He promised him not only wisdom, but also wealth, honor, and long life. He had already been endowed with extreme personal beauty. Immediately following this vision the wisdom of the king was tested in a way which showed that his God was a faithful promiser. Into the royal presence two women of bad character were ushered by the authorities, bringing two babes, the one living and the other cold in death. In the night the latter's mother had by accident smothered it, whereupon she had stolen the living babe from its mother's side. In the morning a bitter conflict was waged by the two women over the living child, each wildly claiming it as her own. When the officers of the law were appealed to they brought the case before their king, whose wisdom and fitness to judge a great kingdom were now to be tried. As the spectators of the dramatic scene looked on, it was with anxious curiosity, which in a moment was turned into horror as Solomon ordered a stalwart attendant to take a keen sword and cut the living little one into two parts and give to each mother a half. One of the women appeared stolidly satisfied with this arrangement, but the other sprang between the babe and its executioner, and, weeping, pleaded that its life might be spared and her rival be permitted to have the whole child. In this pity and tenderness Solomon discovered the true mother heart, and to her gave the babe, while the news of the marvellous wisdom of the new king spread like wild-fire through Jerusalem and all Israel. Solomon had now secured an assured place in the hearts of his subjects, and was firmly seated on a throne from which for forty years he governed Israel with a rule whose wisdom was surpassed only by its magnificence. Solomon's government was Asiatic, that is it was an absolutism, marked by luxury, display, and taxation so heavy as to amount almost to oppression. Its luxuriousness and display are illustrated by his seraglio, which included seven hundred wives (1 Kings xi. 3); and its despotic nature is seen in such acts as his summary and severe punishment of Adonijah, Joab, and Abiathar. For the first time in the history of Israel, alliances were entered into with other nations. We have already seen how Solomon had married an Egyptian princess. Then he made a treaty with his neighbor on the Mediterranean coast, Hiram, king of Tyre, who in exchange for corn agreed to supply Solomon with timber for building the Temple and his own magnificent palace. The timber was floated down from Tyre to Joppa whence it was transported to Jerusalem or wherever needed. At peace with surrounding nations, and with a thoroughly systematized and centralized government, Solomon sat on his throne of ivory and gold and looked around on his people, to see an astonishing increase of population and a tremendous growth in business and wealth, especially during the first half of his reign. Entering his court and his household, one saw all things in keeping with his Asiatic government: magnificent palaces, surrounded by beautiful gardens; multitudes of slaves, each one having his work and doing it with swiftness and precision; troops of courtiers, and a harem of seven hundred wives and three hundred concubines. Around his gorgeous throne stood his officers and attendants, in his stables were forty thousand horses, and chariots in proportion. Whenever he went forth before his people it was to dazzle them with his splendor. But, fond as he was of display and of women, he nevertheless did not neglect the business of his kingdom, a large part of each day being spent either in his throne-room with his officials, or superintending his great public and private works. Besides this no inconsiderable part of his time in his home was given to study, meditation, and writing. The king was one of the greatest builders of the ages. Among the structures erected by him, easily first in splendor was the Temple. In Solomon's Temple lies Solomon's true greatness and glory rather than in his songs, his proverbs, his riches, and his outward splendor. It was the bud whose blooming was in Christ and Christianity. Around it was to be preserved the people chosen to save the true knowledge of their God for the human race and produce the human nature of Jesus Christ, humanity's incarnate God and Saviour. The conception of a fitting, permanent, earthly abode for Jehovah, and for the ark and the sacred symbols therein, was David's. He it was who took the ark to Jerusalem and placed it in a temporary tabernacle or tent while he collected money and materials for a great shrine. To aid him in his great work David had already secured the friendship of Hiram, king of Tyre, with whom, as we have seen, Solomon made a treaty, and from whom he procured both workmen and materials for his great enterprise. The Temple was begun four hundred and eighty years after the exodus from Egypt, in the fourth year of Solomon's reign, or 1012 B.C., and was completed in the twelfth year of his reign. Its site was Mount Moriah at the point where Araunah's threshing-floor had been, and where the angel met David at the time the plague was stayed. In keeping with the Temple were the gorgeous palaces on which for thirteen years Solomon lavished time and toil and money. In the "Tower of the House of David," as one of these was called, hung a thousand golden bucklers; while in the great judgment-hall stood the far-famed throne of the great king. (1 Kings x. 18-20.) 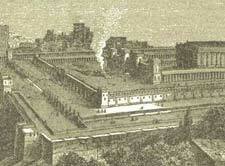 Solomon's other buildings were beautiful gardens and pools, and aqueducts and a luxurious summer resort. He moreover, either established or built many important towns or fortresses, among others being Tadmor in the wilderness, afterward celebrated in history as Palmyra. Countless workmen and inestimable wealth were involved in the building enterprises of the great king, which included at the last, to his shame, rival temples to Moloch, and the other false gods of his heathen wives. Of course, Solomon's government, household, and buildings, as we have considered them, involved the accumulation and expenditure of vast sums of money. But the king's ambition, energy, industry, and business talent rose to the height of these demands. From two sources he drew his vast wealth, namely, taxation and commerce. He received large revenues in the way of tributes from subject peoples, in addition to the increasingly heavy taxes which he imposed on the people of Israel. Besides taxation, the king increased his wealth by means of his great commercial operations in the desert, which was the highway between the Orient and the Occident, and by means of his two fleets, one on the Mediterranean and the other on the eastern arm of the Red Sea, which provided a waterway to both Southern Asia and Western Africa. So rich did Solomon become from these sources that it is said that he "made silver and gold at Jerusalem as plentiful as stones." (2 Chron. i. 15.) There was, however, one fatal fault in Solomon's commercial policy: all the gain went to the palace and the government. Herein lay one of the secrets of the division and fall of the nation immediately upon the close of his career. Naturally, Solomon's commercial greatness, together with the pomp and splendor of his court and government, carried his fame to all parts of the earth. But that for which he received the greatest respect from surrounding nations was his wisdom, manifested in many ways but chiefly in his writings. One of the marked effects of David's long and vigorous reign was to stimulate mental activity in the Hebrew mind. The great foreign wars with the Egyptians, the Phoenicians, the Sabeans, and the surrounding nations, who were more or less advanced in a knowledge of the arts and sciences, had the effect of widening the range of knowledge of Israel as a nation, and of stirring her up to an ambition to excel her neighbors in affairs of peace as well as in those of war. 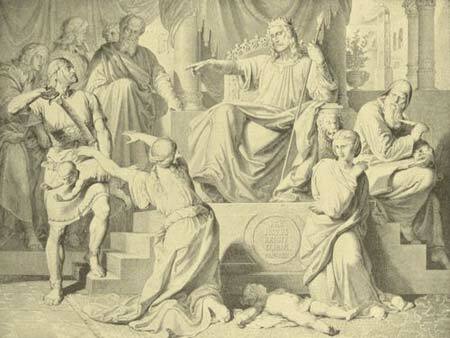 Solomon's peaceful and wise reign, characterized as it was by commercial prosperity, gave the people both the time and means for cultivating the arts. In study and in wisdom the king was the leader of his day and generation. He was learned in political economy, a great king. He was learned in music and poetry, having composed some of the most beautiful of the Psalms, such as the second. But in cultivating the fine arts he did not neglect the physical sciences, for he was a botanist, writing of all kinds of trees and plants; and he was a natural historian, writing works on beasts, birds, reptiles, and fishes. It would be most interesting to see these science primers prepared by Solomon, and compare them with what we see on the same subjects in our own day. But the Bible has not preserved them, and they have long centuries ago passed into oblivion. Solomon's knowledge was not of that shallow sort which is limited to the sphere of earthly material, "seen things;" for he was wise with that deeper knowledge which has for its object God and the human soul, and their natures and movements in their natural relations. This wisdom is illustrated and handed down to us in his Proverbs of which we are told he spoke three thousand. A portion of these is in the Book of Proverbs, the others are lost to us. In his poetry also was crystallized much of his wisdom. This consisted of one thousand and five songs, all of which have gone down in the flood of years, with the exception of the Song of Solomon, which is an epithalamium, in which pure wedded love is incarnated. It is a sort of poetry of the family relations, and, therefore, worthy a place in the sacred canon. Taken literally and read with a pure heart, it is eminently fitted to spiritualize the family relations. This theory of this much discussed portion of Solomon's writings by no means shuts out the more spiritual use of the book, wherein we see in it the Church represented by the bride and God by the bridegroom. In Ecclesiastes we have the latest conclusions of Solomon's moral wisdom. Read in the light of its general scope rather than the dim light of detached portions, it appears as the confessions of a humbled, penitent, believing, godly man, who, after piety followed by apostasy, comes back to piety with the conclusion that after all, "the fear of the Lord is the beginning of wisdom." Through his writings and sayings Solomon's genius flashed from Jerusalem into the surrounding darkness of the heathen nations, and lighted by its rays, as mariners by the beacon in the light-house tower, there came of all people to hear the wisdom of Solomon, from all kings of the earth, which had heard of his wisdom, (1 Kings x. 1-10.) The celebrated visit of the Queen of Sheba is a deeply interesting illustration of these royal visits to the court of Israel's splendid king. Such was King Solomon the magnificent, and such the life of one of earth's most famous men. But, after all, he is a striking illustration of Plato's saying, that "Princes are never without flatterers to seduce them, ambition to deprave them, and desires to corrupt them." So, forgetting that as a king he was God's vicegerent, he lived more and more to gratify his lusts and ambitions, and to please his flatterers, especially his heathen wives. These finally seduced him into permitting temples to be built to Moloch and their other false gods. This ended in Solomon's becoming idolatrous himself. Then his wealth gradually melted away, his allies plotted against him, and, in the midst of life, being about fifty-eight years old, he died in the year 975 B.C., leaving a terrible legacy to his sons: a corrupted religion, a depleted treasury, and a discontented and broken people. Although there is every reason to believe that Solomon died a penitent man, yet his sins and the consequent wretchedness of soul, and the ruin of his kingdom, teach most emphatically the weakness of human nature, even when accompanied by the greatest genius, the perils of material prosperity, and the real insufficiency of all possible earthly good to satisfy the wants of the soul of man.